A month or so ago Kevin Hills, Phil Charles and I discovered that a AAVSO comparison star was actually an Algol-type variable of an unusually short period of 0.235 days with primary and secondary minima of about 0.025 and about 0.01 respectively. The star is of 12.0 magnitude and is catalogued as TYC 444-2670-1, aka GSC 444-2670. I, and others, have been unable to find any spectroscopic information whatsoever, not even as much as a spectral class for the primary. My guess is late F and early M but others have suggested early to mid G and late K.
It is low down in the UK skies in Oph but perhaps someone could take (at least) low resolution spectra to determine the primary's spectral type. There's a good chance of it being a spectroscopic binary too (from the short period) and if that's measurable it will tell us the masses, etc, of the stars. If anyone is willing and able to give it ago I'll very gladly provide as much additional information as I can. I just saw your post late last evening here in Arizona. I tried to take a quick peek at the target with my Shelyak LISA spectrograph but could not reliable identify the target star in my auto guider image before I hit my Horizon limit. The FOV is only about 8’x6’. So no spectrum. The J2000 coordinates I used were RA 18 20 12.29 and DEC +07 15 59.20 taken from Sky Safari 6. Perhaps you can provide me with more accurate coordinates and I will try to take another look. Thank you for the RA and DEC coordinates. When I enter yours into the AAVSO Variable Star Plotter the 12.0 star is dead center. 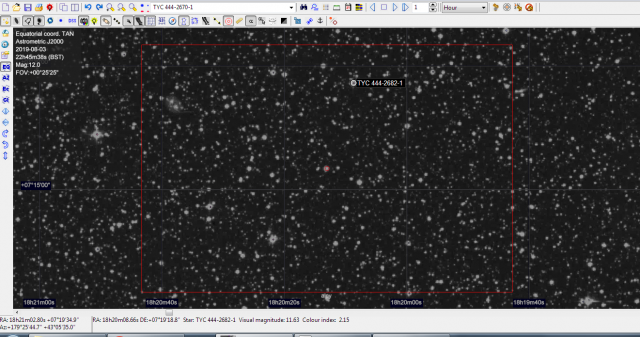 This is the star I guessed from the Sky Safari coordinates and was able to collect spectrum data on Friday night. I took 8 300sec exposures. I used HD183324 as a Reference star from atmospheric and Instrument correction. Looking at the data It would have benefited from longer exposures which I may try next time. See spectrum in Tim Lesters PlotSpectra. My friend Bob Buchheim suggested we get out Gray and Corbally “Stellar Spectral Classification” to see if we could try and classify this target. We concluded that it is likely an early G star. But given this is a double star then it is hard for us to separate out the K or M component as Paul suspected in the spectrum. The primary and secondary minima that Paul described are to my thinking very small. Wondering if this is just sort of a grazing orbit where we are seeing both stars all of the time? Thanks! If it is an early G, which looks very likely, then the known distance (from GAIA) and reasonably well-characterized interstellar absorption in that part of the sky will let me estimate its expected apparent magnitude. Comparing that with the known magnitude (again from GAIA) lets us estimate the brightness of the secondary and, hence, its absolute magnitude, leading to a plausible guess for the latter's spectral type. It certainly looks like it. Typing the coordinates into https://www.aavso.org/apps/vsp/ produces a nice finder chart. It was found while investigating the X-ray transient MAXI_J1820+070 fpr which it is an AAVSO comparison star labeled "120". The field is crowded which has led to issues with photometry too.